Kids Hand Crank Car - Roll Models Ind. 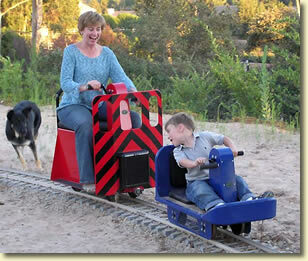 - RMI Railworks Miniature train and railroad equipment for your club, backyard, or park. Your child or grandchild will never sleep more soundly! RMI's Kids' Hand Crank Car is an instant hit and is guaranteed not to sit still for very long. Ideal for backyard tracks, temporary layouts or branchline travel. Perfect for kids from three years old (supervised, of course!) to twelve (absolutely supervised! ).